As a Northern Virginia dog owner living in such a crowded area it can be frustrating trying to find an open space for your dog to play in. Luckily, there are dozens of dog parks for you and your dog to explore. They vary in size, terrain and features, but some are outstanding compared to others. It’s a given that you have to let your dog out of the house at least once a day to go for a walk, but like most of us, you may not have time each day to take your dog to the park. When that first warm spring weekend finally comes, you’re probably very excited to spend some free time playing with your canine best friend. But how will you know where to go to have the most fun with your dog? Don’t just settle for the park down the street because in this blog post, we share with you the top ten dog parks to visit in Northern VA.
Glencarlyn Park is probably one of the most well-known dog-friendly parks in Northern VA. It has ample space for your dog to roam around unleashed so they can play uninhibited. This park is unique because it doesn’t have a fenced-in area for dogs, so there aren’t any limits to where your dog can explore. The park itself is amazingly scenic and quiet considering that it lies in the heart of Arlington, VA. One of the best features of Glencarlyn Park is that it is nested in the woods by a flowing stream. If your dog loves to chase squirrels, rabbits, or go for a swim, then they will absolutely love it here. But be careful to keep an eye on your dog at all times, because with no boundaries to restrict them it can be easy for them to get lost. This is park is the best of the best, so be sure to stop by and enjoy a day here. Shirlington Dog Park is an enormous off-leash dog park in Arlington, VA. 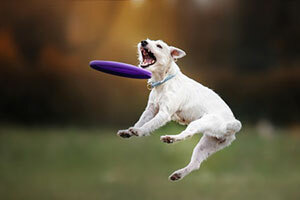 It is especially popular on the weekends when many owners bring their dogs out in the sunshine to play. Dogs have big, open, shaded spaces to roam free, splash around in the stream, and play with other dogs they meet. Water fountains are provided on a long stretch of walking-paths, and there is even a self-dog washing shop right outside the park! For just $20.00, you can wash and dry your dog and give them a treat. As one owner put it “This is dog-heaven” You can’t go wrong if you check out this dog park. Stop on by for a little piece of heaven for you and your dog. While it may be a little bit of a ways away for some dog owners in Northern Virginia, Vint Hill Dog Park in Warrenton, VA is one of the premier dog parks around. Aspart of a non-profit organization, Vint Hill is a private dog park with a few more rules to keep the park clean and safe, but it is still open to the public. It includes a small dog play area, provides bag for dog waste, is well-shaded, and has a big water station for when your dog gets thirsty. A great feature of this off-leash dog park is that there is plenty of play equipment included, like tennis balls and some obstacle courses. There is also a shelter, perfect for your dog to stay protected under the rain or summer heat.. Vint Hill’s Dog Park community also hosts many dog friendly events and cares deeply for the dogs that come for play. If you are able, it is well-worth the drive to bring your dog out to the park. Chandon Dog Park is the only off-leash dog park in Herndon, VA giving dog owners a little bit more freedom when it comes to looking after their pet. Though it is fenced in, it has ample room for your dog to play. This is the place to be if your dog is social and loves to play with other dogs, but if your dog prefers only to play with you,, you can find tennis balls on site to play fetch.The park also provides fresh running water, includes water bowls for your dog to drink from, and has lots of trees for shade that will keep you and your dog cool and refreshed during the summer months. River House Dog Park is a semi-private park located behind the Ashley Building of the River House apartment complex in Pentagon City. Technically the park is only open to residents of the apartments but if you find parking nearby there’s nothing stopping you from bringing your dog to the park. There are two separate parks for smaller and larger dogs and both have access to a water fountain in case your dog gets thirsty. Owners are friendly and considerate. Everyone picks up their dog’s waste and removes their dog from the park if he or she is getting too excited and misbehaving. This is definitely one of the best hidden dog parks in Northern Virginia. Towers Park is a small four-acre park in Arlington, VA. Its dog park is perfect for small to medium sized dogs and hosts grass terrain unlike some other dog parks in Arlington that only have hard surfaces. Although it may not boast the biggest size, Towers Dog Park still offers generous space and friendly owners to chat with while your dogs play. Dogs are allowed to play in the dog park off-leash, but if you want to take a stroll through the park with your dog on their leash this is another great way to enjoy a day at Towers Park. This dog park is located in Chantilly, VA and is one of the more unique dog parks in Northern Virginia. It is surfaced with wood chips and mulch, which is quite different from the other dirt, gravel, or grass dog parks in the area. The surrounding trees provide natural shade for you and your dog to play comfortably in the summer months, but make sure to bring your own water and a harness. One of the top highlights of South Riding Dog Park is its doggy obstacle course. No other park in the area offers as playful a feature as this one, and it’s almost certain that your dog will try to drag you back here every day. South Riding Dog Park is a smash hit for dogs of all sizes. Stop on by and see for yourself! South Run Dog Park is a perfect place for your dog if they like playing on various terrains from grass to gravel. It’s a small, fenced-in park, but has plenty of space for your dog to play with other small to medium-sized dogs. Owners are friendly and are happy to chat while you watch your dogs play. If you want to have some more fun with your dog and get better exercise, you can also walk with your best-friend down some of the different trails South Run has to offer. When visiting, always make sure to bring your own water and a leash to keep your dog safe, healthy, and happy. This large and wide-open spaced dog park is located in Alexandria, VA and tops out as one of the best in Northern Virginia. If you’re looking for a great park to bring your energetic dog and let them frolich around in the grass off-leash, then Duke Street Dog Park is the place for both of you. It’s fenced in, so it’s easier to keep an eye on your dog to make sure they stay happy and safe and don’t run off lost. There are tennis balls for fetch and plenty of other dogs for yours to make another friend. Owners of other dogs are friendly and take care of their pets to make sure they don’t get out of hand and that the park stays clean. Though the park does provide water bowls, don’t forget to bring your own water so your dog can have fun and stay hydrated. If you live in Alexandria, don’t hesitate to bring your dog and check out Duke Street Dog Park. Benjamin Banneker Park is another Arlington dog park that is a small, convenient place to let your dog roam free off-leash to play. It’s another fenced in park, so it’s a little bit easier to keep an eye on your dog and ensures that he or she doesn’t get lost. Water is provided, as well as plenty of natural shade and some nice park benches. If you want more space for you and your dog to run free, there are plenty of large, grassy fields for exercise and play. Benjamin Banneker Park also hosts many running trails if you and your dog love to run together. Overall, this is a fabulous park to bring your dog along with you, and is well worth the visit.